With our product line PatInForm you’ll get standard software that can also be subdivided into single modules. You start with the basic application "Patents/UM" or with the basic application "Trademarks/Designs" and use additional modules later on. With each basic program you receive the complete function of, e.g., watch of terms, watch of fees, evaluations and searches, an interface to Microsoft Word, patent offices forms, user administration independent of networks, address administration, etc. An on-line help on the screen and a detailed administrator manual as well as about a lot of already pre-defined reports taken from the practice belong to the delivery, too. PatInForm is ready to work in a very short time. As required, however you can change the supplied standards at any time (table lookup, menu-driven, knowledge in programming is not necessary). Additional information such as cost centre, cost unit, business unit, attorney, webmaster etc. Collection of services for investigation, consulting, applications etc. Creating of individual tree structures including free descriptions (folder names) for every transaction type (for instance patents). Direct link via Windows Explorer function "Send to"
Using the electronic folder, you are able to archive case dependent documents and E-Mails (to invention cases, patents, trademarks, designs oppositions and contracts). Many documents will be saved automatically. The archived documents can be displayed directly while you are working on current cases. For every transaction type you are able to define a separate tree structure, documents in any order can then be saved to your trees. 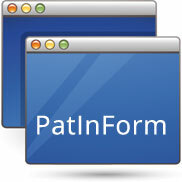 The document file structure definition on your server will be done by PatInForm. Using the global electronic folder, you are able to have independent folder access to every document stored in your electronic folder. Using the tree structure or via the search functions you’ll find (documents, photos, drawings, E-Mails) very easy. You can collect documents in any order to your private favorite folder or to your private shopping cart, to send for example E-mails including the collected documents as attachments. Your already defined tree structure will be automatically used by i.Folder. Data, generated by our intranet products, must be confirmed by a patent department expert. After confirmation, the data and documents as well will be stored to PatInForm automatically. The permission takes place in PatInForm as well as in our intranet products.